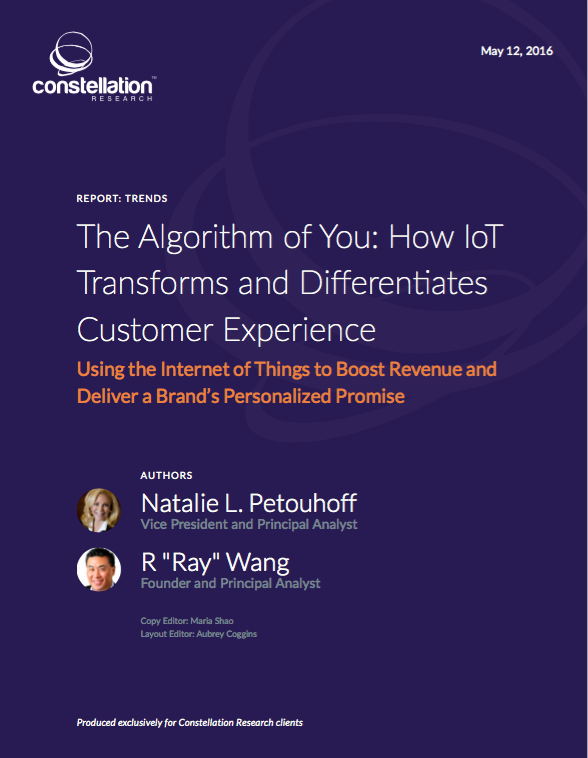 The Algorithm of You: How IoT Transforms Customer Experience | Constellation Research Inc. The Internet of Things (IoT) promises to revolutionize the way business is run and to create differentiated customer experiences. IoT allows for the processing of massive numbers of device events and for commingling those events with business and customer events. This combination generates the next-best, in-context business actions, and thus, smart, differentiated IoT-driven customer experiences. Companies use “the algorithm of you” to collect and process a myriad of data on each customer and potential customer via the IoT. This allows companies to know customers and prospects better and to deliver offers, products and services that are relevant and in context to clients’ real-time needs and desires via channels and devices customers prefer. In essence, the company learns over time about its customers and can automate the data processing and reasoning tasks to create superior customer experiences. In turn, these IoT-enhanced customer experiences, designed to impress, amuse and increase the customers’ loyalty to a brand’s products and/or services, will allow companies to gain more revenue and deliver on the promise of the brand. Learn how can your company turn the idea of “IOT-driven customer experiences” into a tangible reality. This report details how to use IoT to create positive effects on both the bottom-line and the customer experience. The next report in this series will examine how the Internet of Things powers the “as-a-service” economy, in which winners and losers will be determined by he quality and uniqueness of the customer experience.